Something you share may seem obvious but not to all. We can all glean and learn from each other. So... who wants to start? My biggest money saver is probably something those of you with kids/larger families already do: actually plan meals. It is just my hubby and I, and cooking for only two allows a little too much "winging it" and not planning, but I am changing my ways. I was throwing away too much expensive produce and other perishables when I did not have a definite purpose for them but they looked good in the store, or I thought "maybe I'll make Dish X" but then did not get to it. Having specific uses for things and not chucking slimy produce has cut down my grocery bill by 10-15 percent. I was inspired by a friend with six kids who plans an entire month worth of meals at a time. I'm terribly pleased with myself for planning one week! Helped my 19 yo daughter move, avoiding the cost of a moving truck. Gave my 19 yo a clothing drying rack to lower her cost on the electric bill. Gave my 19 yo garden onions, 2 garden tomatoes, garden potatoes, 7 farm fresh eggs and milk, so she won't have to buy it. Hubby got a new lawn mower tire today for $20.00 that was marked $52.00, YAY! Hubby and son are working on the car today, avoiding a huge car repair cost. Used my homemade laundry detergent to wash a load of laundry. Decided rather than buy a new necklace or pay to have mine repaired, I would use parts from an old necklace to repair the clasp on my favorite one. April is Autism Awareness month. Autism affects 1 in 88 children (1 in 54 boys, including my son). Go to http://www.autismspeaks.org/ to learn more and help Light It Up Blue on April 2nd! Great tips girls, keep them coming! Cindy, I can really relate to the produce wasting thing! For years I would purchase something with hopes to make a certain dish but never got around to it for whatever reason and then it's gone. Good job! Kristina, I bet your daughter is so pleased! Great deal on the tire too. It is a blessing having the knowledge for repairing vehicles. Something I want to learn more of. ~Making Blueberry-Zucchini Bread today with some of our zucchini harvest for the freezer to have on hand. ~Saved some foil and baggies, this is something I always do. And yesterday, I borrowed movies and books from the library. For dinner I am using my garden, home grown potatoes and carrots, along with chickens, that we raised ourselves. I'm not sure if the chickens save us a lot of money yet, but they save us our health and that saves on medical bills (avoiding chemicals and antibiotics). On our trip to Maryland today to visit family, we drove through Chambersburg, which is famous in our parts for their peaches. We stopped by a farm stand on the way to our destination toward the end of the day. Since we were some of the last customers before they closed up shop, they sold us an entire bushel of peaches for an unbelievable discount - and they're perfect! We saved over half what we would've paid had we bought the peaches if they had been "imported" here to our local fruit stand! And they were freshly picked this morning! How cool is that?! My goodness, my van smelled wonderful all the way home, too! Looks like I've got my work cut out for me over the next couple of days! :) SO worth it, though. 'Best peaches EVER!!! I'm thinking I'm going to can some, dehydrate some, make some peach preserves and salsa, and even share some with our neighbors. I think I may even try my hand at making peach vinegar from the peels! SO excited!!! That's awesome Nini! I would love to get more peaches. We didn't even make peach pie this season. Yesterday, I dehydrated my own garden onions to make my own onion powder. My son, today, road along with the construction crew (they all piled into two vehicles), to save money on gas. I made homemade buttermilk pancakes, using my farm fresh eggs and buttermilk marked down to $1.00. There was enough made for breakfast for two days. I watered flower beds using rain barrel water. I feel like some of these are repeats...sorry. Isn't it awful how much school pictures cost? I would much rather take my own photos anyway. Great tips! Someday we would love to raise chickens for eggs and meat. I've done research trying to find out cost efficiency of raising your own meat birds and yes you can buy cheaper at the store, but what are you eating? I am with you! I have made my own 'buttermilk' with a buttermilk starter and that works wonderful in pancakes and bread. Repeats are great!!! Sometimes we miss things or don't remember so no worries there! Great score on the peaches! I would love to be able to do that but the Peach Orchards that have the peaches we love are about 3-4 hours away and it just wouldn't be worth the trip unless we were traveling anyway. God does provide :) I haven't tried this yet, but I have seen recipes online for Peach Jelly using the peels and pits. The vinegar sounds good too! ~I will be baking bread. ~I too have been using rain water for watering. It has been rainy here for the past couple of days so it has been great for the houseplants. A friend of mine called out of the blue and wanted to know if I wanted a load of seasoned firewood. YAY It was awesome. Canned turkey broth today! Later is black beans! Girls, your replies make me smile Thank you! Well.... I'm not sure how well we actually "scored" with these peaches. Last night, my hubby wound up in the ER with allergic conjunctivitis(?). At the time they said they are seeing a LOT of these cases coming in, and they aren't sure what's causing them. After asking him a few questions, we learned the big goober ate a peach without washing it (as I told him needed to be done - as I ALWAYS tell him needs to be done, if I don't get to wash the fruits and veggies first! ), at which point the doctor suggested the peaches might be the cause. He said this could've been an airborne bacteria, chemicals on the peaches, or something in the peach could've caused this type of reaction. Needless to say, he's suffering with this pretty badly, he's going to miss at least the next two days of work because our regular eye doctor isn't in tomorrow, and then when you consider all of the medical and prescription copays... perhaps it would've been better had I just bought canned peaches! RRRRrrrrrrrRRRRRR! Men! Why don't they just listen to us? Man... that farmer and his wife really saw us coming! I feel like such a big dummy. :( Lesson learned, though! Lesson learned! Wow, great ideas!! The pics are great! Nini, hope hubby is feeling OK. That's so disappointing when you thought of all the good eats! I find sometimes that peaches will rot around the pit but look normal on the outside & of course by the time you see it it's too late. I lay fruit out on newspapers so nothing is touching so if one goes bad the rest can still be eaten. I'd make jam, fruit leather or pancake syrup from the good bits. I make egg roll/spring roll dipping sauce from less than perfect fruit then can it. Good luck!! Ok this is going to be strange but it did save us BIG money....it's probably not what you're looking for???? I mentioned to the guy that buys baking from me if he knew where a good solid out building was. Our farm really needs some! Within in 1 day I got 4 buildings: 1 for $100 with major repairs 90% finished, 2 free in good shape, 1 half finished that comes with the materials. The happy dance started when he agreed to 2 pies for payment!!!!!!! Oh, that includes moving them here!!!!! Be still my heart!!!!! Planning on covering them with metal sheeting..they'll like great. Today I canned carrots, beans, patty pans, peas, celery. Hung the washing out. That is SO cool, Judy! WOW!!! Congratulations!!! Oh my Judy! That is a wonderful score! I bet your customer is happier with homemade pies though :) And this goes to show that there is nothing wrong with letting someone know that you are in need of something. Alot of people just have things lying around and couldn't care less. Good for you with the canning, I wish my garden was producing more. I am sorry about your honey Nini. I hope that you can accomplish much with your peaches and that it is not a total waste. I have had things like that happen to me too. Not strange at all! Great score! My hubby and I are always up for a good barter! Well... Even though we had to pitch about a quarter of the bushel, I am thrilled to say that I still managed to get 12 quarts of canned peaches, and then I saved the leftover syrup and canned that, too, for use in making peach tea or iced tea (Is that okay? I couldn't find any info online about it.)! All-in-all, not a bad salvage at all! Sharon, I was going to try the peach jelly recipe, but some of the skins just didn't look good and I didn't feel comfortable using them for jelly. I'm definitely going to try it next time, though - it looks awesome! I love using every little bit! Now that's a true FG spirit not giving up & I'm sure your peaches are beautiful & will taste GREAT! Good idea about the leftover syrup. I can't see why it wouldn't be good. YUMMY! Finished off bread & butter pickles, dills & dill carrots. Still drying cabbage & herbs. Canned blueberry cordial & tomorrow choke cherry. Super easy & makes fun gifts. Bartered market sunflowers & glads for 10 lbs of sugar & flour. I couldn't agree more with just letting folks know what you're looking for!! Thanks, Judy! They look okay... They don't look picture-perfect by any stretch, but like my husband said: it's a guarantee that they're going to be delicious! LOL! I actually meant to ask you: how do you make your dipping sauce? And blueberry cordial? Those sound awesome! I keep reading about all the preserving you all accomplish in a day and am inspired! You all do so many great things in such a short time... That surely is a money saver! How do you manage it, though? Canning these peaches and syrups took me 8 hours! I feel like I should be able to accomplish more like you all do! You're all so awesome! What's your secret? Fill quart jar with berries..don't mash the berries into jar just shake it around. I've used nanking cherries, blueberries, sweet & sour cherries, choke cherry, raspberries...any fruit that will NOT turn brown while it soaking. Bring to boil & continue for 10 minutes....use BIG pot to catch splatters! 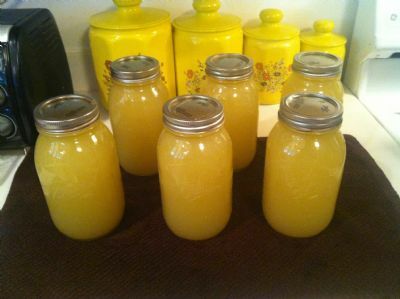 Put into fridge or process for winter.The recipe says to use 1 part cordial to 3 parts water. I let people mix their own. Put the cordial in the glass first then pour ginger ale makes a frizzy drink. ENJOY! I use apricots or peaches. Use fruit that has gone too soft for processing. Cook down mashed up fruit & strain out any big pieces of fruit. Put back into pot & add sugar to your taste. You can boil slowly down thicker or just add some pectin (depends on how much fruit you've use to how much pectin needed) to hurry it along.Use now or process for winter. ENJOY! Sorry, the computer posted with out finishing! NINI, the dipping sauce is like making really THIN jam. Hope that helps. It's yummy over ice cream too! for spring rolls add hot red pepper flakes. PLEASE share the your filling recipe! My mouth is watering!!!! I've made grapes leaves before so have the general idea but the filling wasn't anything to write home about. Do you use fresh leaves or bottled? If bottled any brand I should look for? THANKS! I'll try any saving tips too! My hint today is every month I buy a certificate (you choose what amount) at the grocery store then when Christmas rolls around I don't have to worry about over spending on those little goodies that no one thinks about but sure adds up fast! Christmas is paid for before it ever happens! Well . . . . my hubby and I are bucking our own hay! Cost of hay itself has gone up so much that we feel that it's over the top to pay someone to buck and stack for us. A true test of strength, stamina and energy for these senior citizens! Told my daughter we were going to be doing this today . . . two old people bucking hay would be a sight for sore eyes! We're still pretty danged tough! Okay... so THIS is the crazy way I saved money today: I made a mistake in my checkbook in my favor! LOL! I accidentally recorded a deposit as payment! What a nice (but dumb) surprise! LOL! It's important to roll the grape leaves tight and small, so they're not the big honkin' size that you'd see in Greek grape leaves. You might use about 1 1/2 tablespoons of meat mixture to each leaf, give or take, depending upon your preference, but the key is tight and small. Basically, you take a little of the meat mixture, roll it like a tootsie roll, and place it at the base of the underside of the leaf where the stem is. You pull up the little nubs of the leaf that go past the stem up over the meat, turn in the sides of the leaf over that, then roll up tight. When you pack the leaves in the pot, make sure the pointy end of the leaf is facing the bottom of the pan. Pack the rolls down in the pan, layering each layer in the opposite direction of the prior layer. If the first layer goes lengthwise, then pack in the second layer widthwise. Cover with water and a little salt. Place an upside down dish atop the leaves with a cup of water on top to hold it down. Bring to a boil. In a separate pan, melt a stick of butter (or use ghee, which is a type of clarified butter used in Middle Eastern recipes) and a few cloves of chopped garlic. Remove the plate, and pour this mixture over the grape leaves while they are cooking. Squeeze an entire lemon's juice on top. Sometimes I add a little more butter and lemon than that. Again, my mother-in-law never used exact measures, so for me, it goes by taste. I like to taste the grape leaves, lamb, garlic, butter and lemon. Some people like those flavors to be lighter. It's entirely a personal preference. When you've added the butter, garlic and lemon, replace the plate and cup of water while the grape leaves continue to cook. My mother-in-law's instructions say to cook until the seasonings seep through. To do this, every once in a while during cooking, you have to gently pull the grape leaves from the sides of the pan and kind of nudge them apart from one another to make space for the butter, lemon and garlic to get in between them. I use a knife to gently separate them a little to let everything work its way through, but you don't want to free them up from their layer and have them floating all around. Keeping them tightly packed will help them hold their shape. You just cook the grape leaves until the rolls are firm and the rice is cooked. Maybe an hour? Not sure... I never really timed them. They are awesome hot or cold, as an appetizer or as a whole meal. Some of my hubby's friends even put them on pita bread for lunch! LOL! Nini, THANK YOU soooo much for sharing! What a treat!!! I cook like your MIL, giggle, it's hard for me to measure anything. You've been very generous.